There were many headlines that came from this year’s North American International Auto Show in Detroit. Some of those headlines almost did not get covered. The day before curtailed a lot of travel plans for the incoming media and manufacturer representatives due to snow and wind that closed Metro Airport. While some flights were diverted to nearby airports and delayed for hours, others braved snowy conditions on the road just to get into Southeastern Michigan. But once the travel chaos ended from he day before, dawn broke on the first media day at NAIAS. At 6:55 a.m. inside the Atrium of COBO Center, the first set of headlines were filed. One of them was the announcement of the North American Car of The Year. The winner is the car featured on this page. In its 10th generation, the Honda Civic had the monumental task of bringing the brand and the company back to prominence. Many felt disappointed by the lack of design vision and superior engineering Honda was once known for. The Civic created many benchmarks in terms of vehicle efficiency, advanced exhaust emissions technology, engine development, safety engineering for compact cars, and design advances that simply came out of nowhere. Though they were among the ten best-selling vehicles in this country for 2015, many felt that buying a Civic was for just mere basic transportation. Sadly, the Civic’s image reflected buyer’s moods: they were reliable, well-engineered, and will last a long time. That was all, nothing more, nothing less. Yes, the Si models were exciting, but the bulk of customers chose middle-of-the-road models that offered enough amenities to be merely entertained on their daily commute. Honda knew they had to steer this new Civic back to its roots. It had be advanced again. It had to disrupt the class with design, interior space, and outstanding engineering. Honda had to show the jury for the North American Car of The Year that they did their homework to make the best Civic yet. Did it deserve being the North American Car of The Year for 2016? For one, we had not been satisfied with Honda’s design language lately. This Civic has brought forth a new progression of sleek, sharp, and eye-testing styling that had been the hallmark of Civics past. The three-dimensional front end is combined with a low, long, and sleek fastback-style profile with the debut of a three-window side glasshouse never seen before in Civic sedan history. Where the Civic becomes distinctive in the rear, with its sharp-edge taillight design that is integrated onto the short decklid. Our tester is the current top-of-the-line sedan, the Touring. Never before has a Civic ever looked luxurious. Maybe it is because of its paint or the unique 17-inch alloy wheels that make it stand out. Yet, it shows a new side of the Civic that is as elegant and graceful as the top Accord models…or even an Acura. One complaint that had been brought up on previous Civics has been the interior. Honda addressed this head-on and came up with one of the best cabins ever seen in one of their sedans in a very long time. It starts with a single-tier instrument binnacle that is still positioned low on eye sight, but much cleaner to read than ever. In the Touring, the speedometer and information center is a TFT screen. On either side of the TFT screen are the temperature and gas gauges, now in an interesting LED format. Some of the switchgear may be familiar to many Honda owners, but the steering wheel switches and buttons on the console are new. They are now of a higher quality than before. Overall quality is up across the board on the instrument panel and console. Seating in the Civic felt a bit smaller than before. The front backrests now have a tapered look with added bolstering to lock in most bodies. The cushion is of normal size, with bolstering added for the Touring model. Tall people may need to accommodate their bodies a bit better to clear the moonroof above. In the rear seat, there is an improvement in space, but it is still more suitable for averaged-sized adults and children. The roof slope would also be a challenge for taller persons sitting in the back seat. 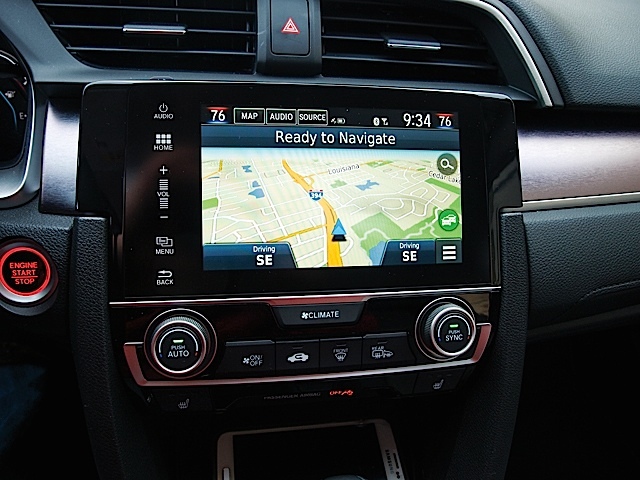 The Civic offers a single touch-screen infotainment interface. This is actually simpler to work with, as audio options, navigation, Bluetooth connections, and most climate control functions operate from here. It is not exactly perfect (the audio system only offers 12 presets for SiriusXM) but it is much more manageable. Two engines are being offered in the Civic sedan for now. The 2.0-liter naturally aspirated four-cylinder offers a power rise for the LX and EX models with 158 horsepower on tap. Move up to the EX-T, EX-L, and this Touring model, and you are treated to an all-new 1.5-liter turbocharged four-cylinder engine. Ticking this box will get you 174 horsepower. Mind you, this is not the engine reserved for the sports compact hero, the Civic Si; yet, it certainly makes the Civic a lot more motivated and fun to drive. Civic Touring customers are treated to an all-new Continuously Variable Transmission driving the front wheels. The transmission is suitable, yet there is plenty of noise and ratio hold when starting off or getting up an on-ramp. Once it settles down, the CVT offers smooth connection to the engine. In terms of fuel economy, the Civic earned an average of 32.6 MPG. This is considered a serious increase from previous Civics, even with the higher horsepower. 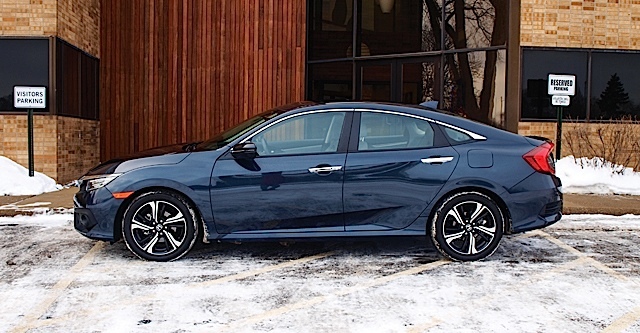 The new Honda Civic sedan is longer (about the size of an Accord of around two decades ago) and heavier (the Touring weighed in at 2,923 pounds). When driving it, you forget that it is a Civic. Part of its from the extra long 106.3-inch wheelbase, which provides a smooth ride that could be akin to something a bit larger than its compact class status. There is minute roll and learn in the turns, but it remains poised overall. 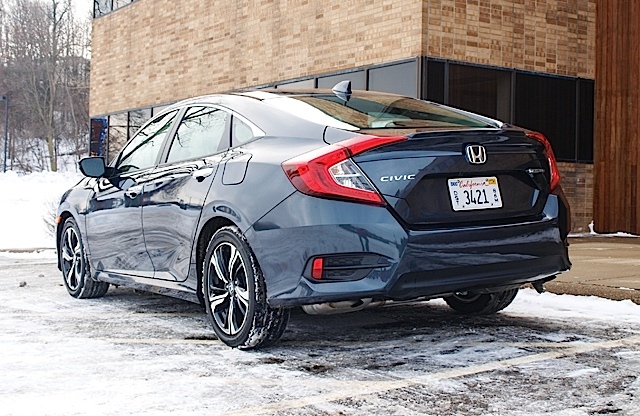 Seventeen-inch Firestone all-season tires keep the Civic on the ground. Steering is pretty direct and sharp in feel. Turning is tight, even with the long wheelbase. Part of the trick is the location of the front wheels positioned closer to the nose of the Civic. On-center feel is a bit soft, however. Braking is actually very good, with great pedal response and solid stops in normal, panic, and winter situations. Standard on the Civic Touring model is the Honda Sense active safety suite. These features are usually reserved for the Accord, Pilot, and most Acura models. Putting them on the Civic is a step in catapulting this car into another dimension. Features that make up the Honda Sense package include Adaptive Cruise Control, Lane Departure Warning, Lane Keep Assist, Forward Collision Warning, Collision Mitigation Braking System, and Road Departure Mitigation System. Honda LaneWatch adds a camera eye on critical right lane/turn situations. All of these systems work very well, but the idea of having all of these features in a compact car is still amazing in its own right. Honda starts off with a base price of $18,640 for a Civic LX with a six-speed manual transmission. This Touring sedan tester tops off the lineup with a sticker of $27,335. Somewhere in-between is a well-equipped car that is transformative and more engaging than ever before. So far, customers have responded to the new Civic. Sales are up because of this new Civic: 54.9 percent in January, resulting in it being the leading model in Honda’s lineup. 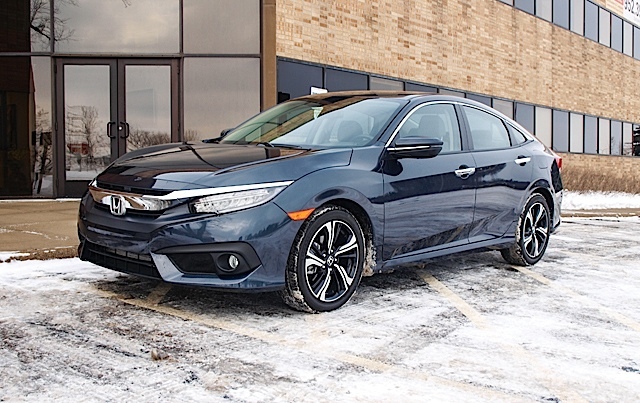 Even with a recall of the base engine, the Civic still represents a major leap for Honda to not only retain its loyal customer base, but to attract newcomers or returnees to the brand. However, I am still trying to wrap my head around this 10th generation Honda Civic. Is it really a Civic? The design, level of quality, and refinement tells me otherwise. When people came up to this car, they swore it was an Acura or an Accord. Perhaps that is a compliment on how much work Honda put in to making this not only a sales leader, but a leader above all cars, regardless of class.